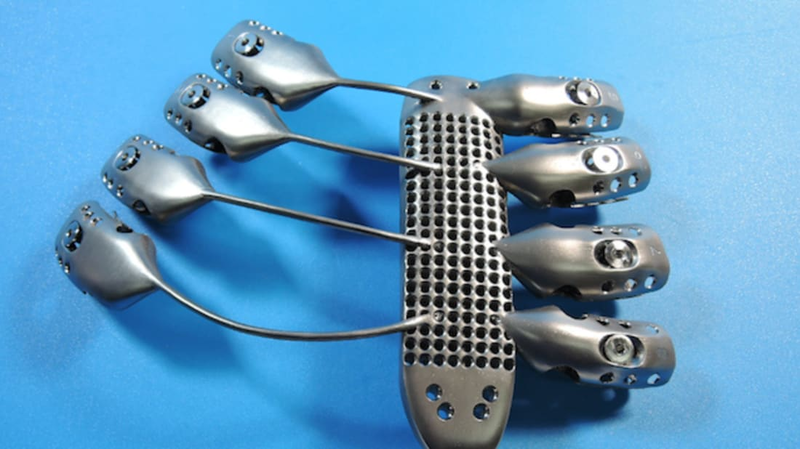 In a groundbreaking surgery, a 54-year-old Spanish cancer patient had his sternum and a portion of his ribcage replaced with a 3D-printed titanium implant. The patient, whose name has not been released, suffered from a chest wall sarcoma, a type of tumor that adheres to the cage of bones and tissue protecting the heart and lungs. His surgeons, Salamanca University Hospital’s José Aranda, Marcelo Jimene, and Gonzalo Varela, knew that finding an artificial replacement for the affected bones would be complicated work, and enlisted Australian medical device company Anatomics to create the necessary implant. “We thought, maybe we could create a new type of implant that we could fully customize to replicate the intricate structures of the sternum and ribs,” Dr. Aranda says in a press release issued by the office of the Australian Minister for Industry and Science. Anatomics had the device manufactured in CSIRO’s (Commonwealth Scientific and Industrial Research Organisation, a federal government agency) 3D printing facility, Lab 22. As explained in the video below, 3D printing gave the designers more flexibility, allowing them to fully customize the implant to fit the patient, something that would have been very costly and difficult with traditional manufacturing techniques. To create the prosthetic, the Anatomics team first used a high resolution CT scan to make a 3D replica of the patient’s chest wall. From this, the team could glean the exact measurements and capabilities necessary for the device. CSIRO’s Arcam printer, which cost $1.3 million AUD, “works by directing an electron beam at a bed of titanium powder in order to melt it,” Kingsbury explains. In his press release, Australian Minister for Industry and Science Ian Macfarlane commends everyone involved for this massive step forward in the field of prosthetics. “This breakthrough is an impressive example of what can be achieved when industry and science come together,” he says.